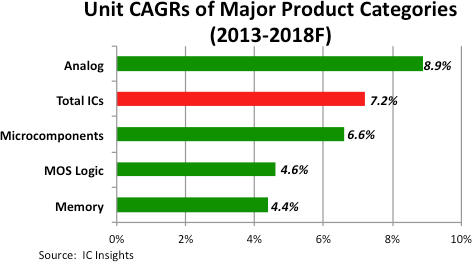 Semiconductor industry market researcher IC Insights forecasted analog IC unit shipments to grow at an average annual rate of 8.9%, faster than the 7.2% forecast for the total IC market and faster than all other major IC product categories (Figure 1). Analog unit shipments grew 15% in 2013 to become the first IC product category to ship more than 100 billion units in a calendar year period and are forecast to grow another 12.4% in 2014. 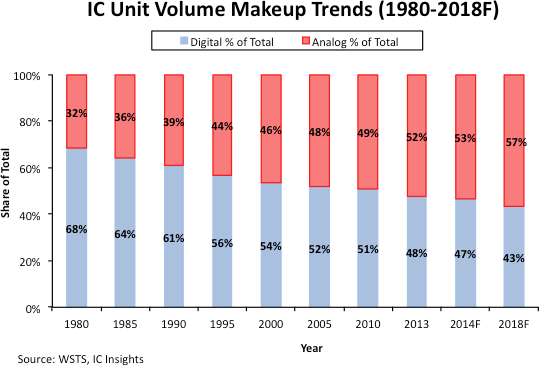 Analog unit shipments as a percentage of total IC shipments have been on the increase for more than 30 years (Figure 2) due to single-chip integration of digital ICs and ongoing system growth that necessitates more and more analog ICs. In 1980, analog ICs represented 32% of total IC shipments, but that increased to nearly 40% in 1990, 46% in 2000, 49% in 2010, and is forecast to grow to 57% of total IC shipments in 2018. Demand for medical/health electronics, LED lighting systems, and green energy management systems (lighting, temperature, security, etc.) for homes and commercial buildings is expected to keep analog unit growth much more robust than other IC product categories through the forecast period. Starting in 2013 and in each year through 2018, analog IC unit growth is forecast to exceed total IC unit growth.